(Bloomberg) -- In a new pilot program, a California utility is paying drivers of BMW electric cars to delay charging their vehicles when the power grid is under pressure. 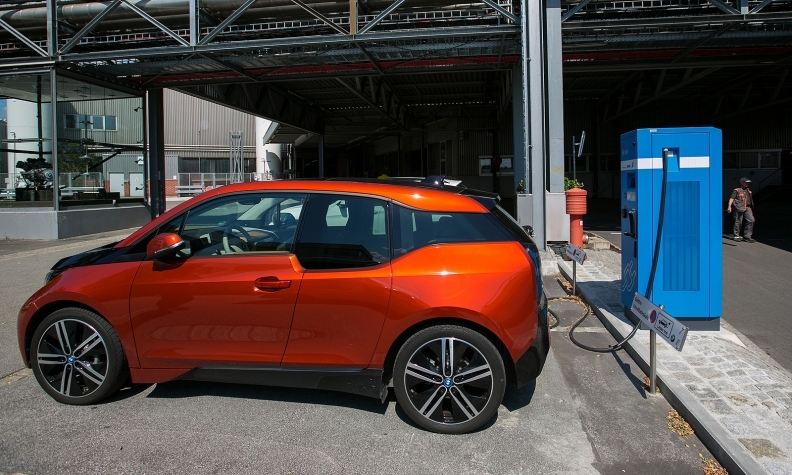 One hundred owners of BMW AG's i3 hatchback receive $1,000 upfront to participate in Pacific Gas & Electric Co.'s 18-month trial, which starts this week and is confined to the San Francisco Bay Area. Peter Berman, a 70-year-old, semi-retired Los Altos psychologist, was selected from about 400 applicants. "My understanding is that we'll get a text message that says 'Hey, you're charging your car right now, can you back off for an hour?'" said Berman, who began leasing his $40,000-plus i3 in October. "This is the wave of the future. We can't continue to be dependent on gas and oil and coal for our energy use. I'm really curious as to how this is all going to unfold." The PG&E-BMW pilot is one of myriad experiments under way worldwide as utilities try to anticipate what will happen if (or when) millions of electric vehicles pour onto city streets and highways. Power companies see both challenge and promise. Yes, electric cars could put more pressure on the grid if everyone plugs them in at the same time. But utilities could also tap batteries for backup power when the grid is under strain or temporarily knocked out in an emergency, paying drivers for the electricity harvested from their parked cars. PG&E estimates that there are 65,000 EVs in its vast northern California service territory, more than any other utility in the U.S. The iChargeForward pilot with BMW is an extension of PG&E's so-called demand response program: asking industrial customers and large building owners to cut back on electricity use when demand exceeds available supply. The utility is also repurposing used Mini E batteries as stationary storage for a solar-powered system at BMW's Technology Office in Mountain View. "We are quite committed to the adoption of electric vehicles in California," said Jana Corey, PG&E's director of electrification and alternative fuels. "The BMW pilot is an effort to demonstrate that we can manage the load on these vehicles in a very reliable way." PG&E is also testing technology that will turn customers' electric vehicles into mini power plants when there's high demand on the grid. In Japan, people have been using Nissan Motor Co. Leafs for emergency backup power since the country took several nuclear reactors off line in the wake of the Fukushima disaster. Thirteen Nissan Leafs are among 36 vehicles being tested at the Los Angeles Air Force Base, currently the largest vehicle- to-grid demonstration project in the world. When connected to the grid with special charging stations, the vehicles can provide enough juice to power about 140 homes. The Air Force has expanded the pilot to other bases, including Fort Hood in Texas and Joint Base Andrews in Maryland. PJM, the grid operator for 13 mid-Atlantic states, is using 20 electric vehicles to balance short-term variations between supply and demand. PJM also aims to tap power from electric school buses, typically idle in the hot summer months. The holy grail is V2G, or "vehicle to grid," which allows electrons to flow both ways between car and grid. Getting there will require buy-in from the auto industry, which is currently pouring more resources into autonomous vehicles and worries that sending electricity from cars to the grid will add wear and tear to the batteries, the most expensive part of an electric car. Still, the potential is immense, researchers say. "There's a huge amount of electrical power in these vehicle fleets that represents an amazing resource," said Tim Lipman, co-director of the Transportation Sustainability Research Center at the University of California at Berkeley. "Everyone is talking about the need to add storage to accommodate all of the renewable energy. If we had grid-enabled vehicles, it would make everything a lot cheaper."